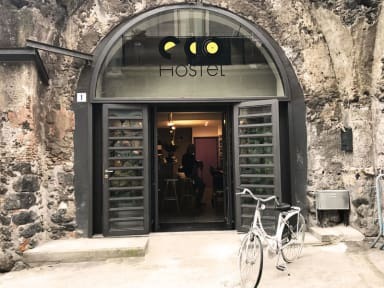 Eco Hostel i Catania, Italien : Boka nu! Wake up in the morning at Eco Hostel with the aroma of coffee, and indulge in our free but lavish breakfast that includes home baked pastries, juices, jams butter and breads, regular and soy milk, yoghurts, fruits, eggs, cheeses and much more. Unwind and relax after your day out in the bar filled with travellers from all over the world. In the common areas you will find a handy kitchenette to prepare a home cooked meal and chat with fellow travellers. Our front desk is also open 24 hours a day. Eco Hostel Complimentary Services include a free daily breakfast, free bed linens, free WiFi, free personal safe deposit, free luggage storage and a free welcome drink of your choice! We are located in the heart of Catania, few steps away from the famous Catania's fish market and couple of minutes’ walk away from Piazza Duomo and from the main street Via Etnea. Few minutes of walk will also lead you to the famous Ursino Castle and to many other historical attractions and interesting spots to explore. You can reach us easily from the airport using the Alibus that will drop you a short walk away from us, we are also easily accessible from the train station, using the city busses, and of course if you need, we offer a shuttle service to pick you up or drop you off anywhere you need to go. 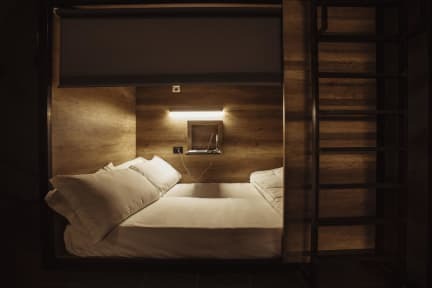 Your own personal capsule bed is equipped with a closet, usb socket, pop-up desk, personal reading light, personal safe deposit and a roll-up blind to guarantee your comfort and privacy. Cancellation policy: 72h before arrival. Payment upon arrival by cash, credit cards, debit cards. This property might pre-authorize your credit card. Towels for renting cost 2 euros.